Current HIV prevalence among women attending ANC in Nigeria is 3.0% (ANC, 2014)  In Nigeria, 58% of the estimated 3,037,364 PLHIV in 2015 were females. (Nigeria spectrum estimates 2016). Estimated number of new HIV infections in Nigeria dropped from 130,295 in 2010 to 104,388 with 55% (104,388) of the new infections found among females. The 2009 national HIV policy has highlighted prevention as a critical strategy for halting new HIV infections in Nigeria. 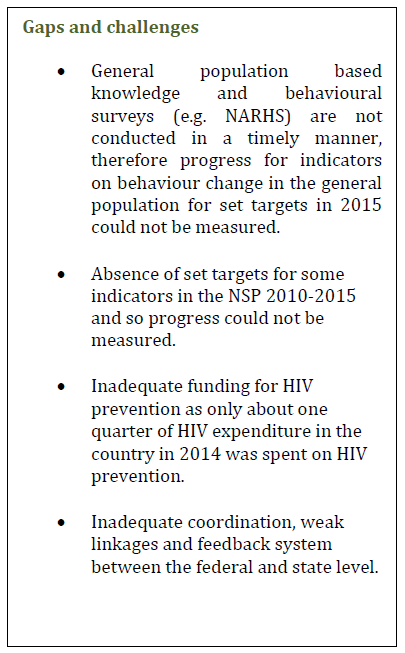 The National Strategic Plan 2010-2015 also prioritized HIV prevention as the overarching goal of the national HIV response. Nigeria developed her first National HIV/AIDS Prevention Plan (NPP) in 2007 for the period 2007-2009 using the Abstinence, Be faithful and Condom use (ABC) approach. The NPP 2010-2012 which introduced the combination prevention approach, locally called the “Minimum Prevention Package Intervention” (MPPI) was launched. The NPP 2010-2012 was reviewed in 2013 and lessons learned was used to develop the NPP 2014-2015. The NPP 2014-2015 seeks to scale up evidence-based programming using targeted interventions and standardized intervention packages at scale. 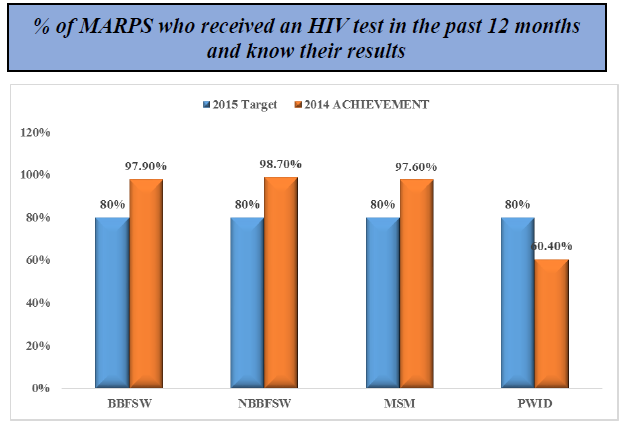 HIV prevalence has declined among MARPS: BBFSW (37% in 2007, 27.4% in 2010 to 19.4% in 2014) NBBFSW (30.2% in 2007, 27.4% in 2010 to 8.6% in 2014) except for MSM which has increased from 13.5% in 2007, 17.2% in 2010 to 22.9% in 2014 (IBBSS, 2007, 2010, 2014). Spending on HIV Prevention in the national response accounted for only 8.7% of total HIV expenditure in 2009, increased to 12.67% in 2011 with a slight decrease of 11.93% in 2012 before increasing to 20.34% and 25.62% in 2013 and 2014 respectively. (NASA 2015). In the World Bank HPDP2 HIV/AIDS Fund (HAF) project 546 CSOs in 32 states reached 83,932 FSWs, 7306 MSMs and 3345 IDUs with MPPI as at the end of 2015. The number of schools implementing FLHE curriculum in the country has increased six fold from 8,335 schools in 2014 to 48,551 schools in 2015. 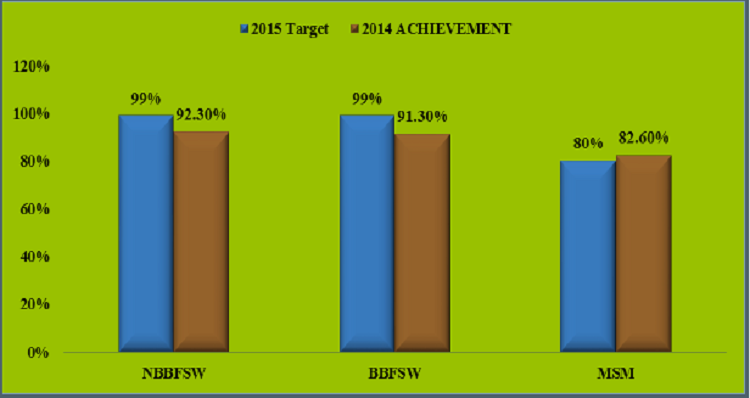 The number of teachers trained to teach FLHE increased from 15,995 in 2013 to 25,113 teachers as at end of 2015.